Earth & Sea have their own fleet of trucks picking up fresh oysters from our Boston shop at least twice a week. Last Wednesday, Ben and I went on a road trip to visit our friends at Earth & Sea Fish Market! Located in Manchester, VT, Earth & Sea has been "supplying some of the finest restaurants and supermarkets throughout Vermont, New Hampshire, and New York State" for almost three decades! The staff are the friendliest people you will meet, especially Bob Yakaitis, owner and seafood buyer of Earth & Sea. 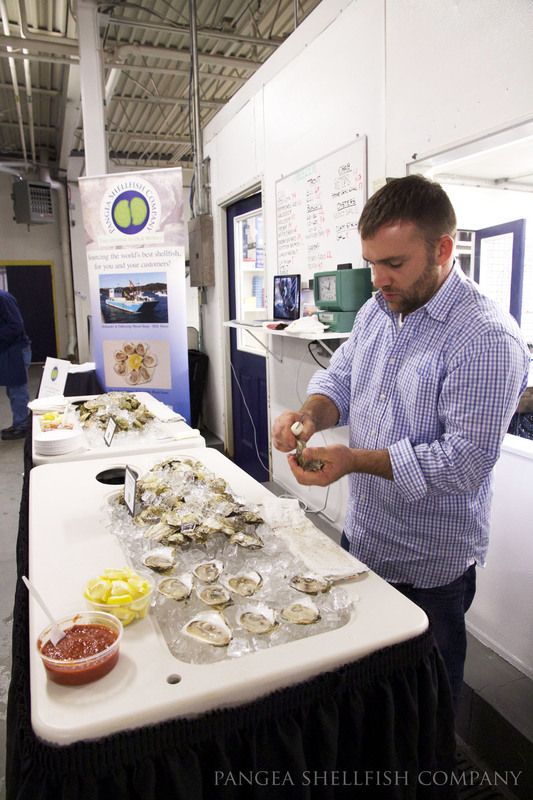 We were excited to represent Pangea and share our love of oysters with Earth & Sea's customers. After tallying up all the tasting votes by the end of the day, our Standish Shore Oysters were the clear winner. Every chef's and restauranteur's eyes would light up when they tasted the Standish. But they were even more impressed after I told them it was all due to 18 months of Ben's hard work! Ben shucking Standish Shore Oysters. Besides sharing some awesome oysters, we also got to meet other purveyors and loaded up on some free samples! And finding out that John Nagle Company is truly a FAMILY company. These boys are all cousins. The John Nagle Co. cousins. If you're in Vermont or nearby, definitely swing by Earth & Sea Fish Market. They have a great selection of seafood (lots of live lobsters! ), wines, and sauces! To see all the photos of the event, click here. Fresh fish and an assortment of seafood on display in the Earth & Sea shop.